Recently, my son's first grade class did a "Flat-Self" project, similar to Flat Stanley only the paper dolls are themselves. 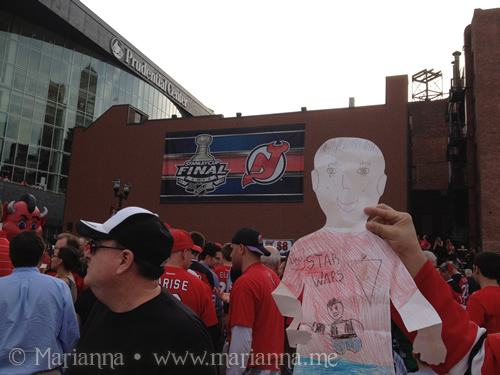 He mailed his to his aunt and uncle who took the paper boy to Game 1 of the Stanley Cup Finals! We are huge Devils fans, so this was pretty awesome. Hanging out with all of the fans before the game started. Don't you just love that he drew himself a Star Wars t-shirt? Opening face-off of the Finals! I never thought I would say that I was jealous of a paper boy! Sadly the Devils are not doing so well in this series and are currently down 0-3. We are hoping for a miracle. That's pretty darn cool. I remember making those in grade school except we had other kids trace our shadow. That's cool! My son never did this project, but we carried our nephew's around once. I've never heard of those before! That'd be pretty funny if you start taking it with you on all of your vacations too! I literally said "Awww" out loud, with no one around me, when I read what they did. That is so sweet! That is so awesome!! I bet your son is pretty jealous of his "flat" self as well! I love the Star Wars shirt! Great project. That is very cool. I bet he loved the pictures! I love flat self! You should take him more places! Maybe flat self will be the miracle good luck charm they need? That is so awesome and pretty darn funny! How cool that his aunt and uncle played along! so cool! 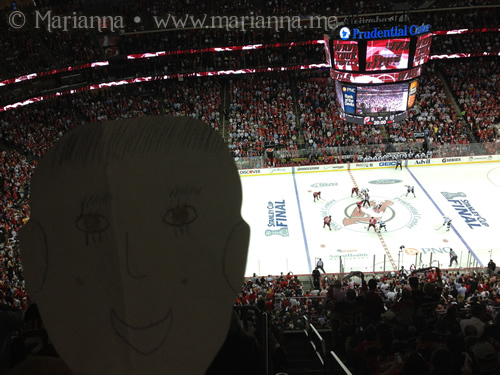 And so awesome that you got to go to the hockey game, too! Very cool, but I guess he didn't bring good luck though. That's great! Our niece sent us a flat "person" last year and we took it around the farm to visit all the animals and help with chores. The we returned it to her class. We had a great time. Love the flat self! Awesome on the Stanley cup action, stinks the devils aren't doing great but hey he was at the Stanley cup! That's so cool! A "flat me" went to Blissdom one year with my best friend MommaDjane! It was funny! What a fun idea!! How cool!